The Best July 4th Celebrations in the United States! The Fourth of July is the biggest celebration of the summer all across the United States. With the kids finished with the school year, and everyone donning their patriotic garb, the party begins to honor the independence of our great nation. On this day, we remember and honor our Founding Fathers as well as all of those diligent individuals that fought for this great country's independence. We celebrate this historic day each year with parades, cookouts, concerts, family gatherings and of course, fireworks. 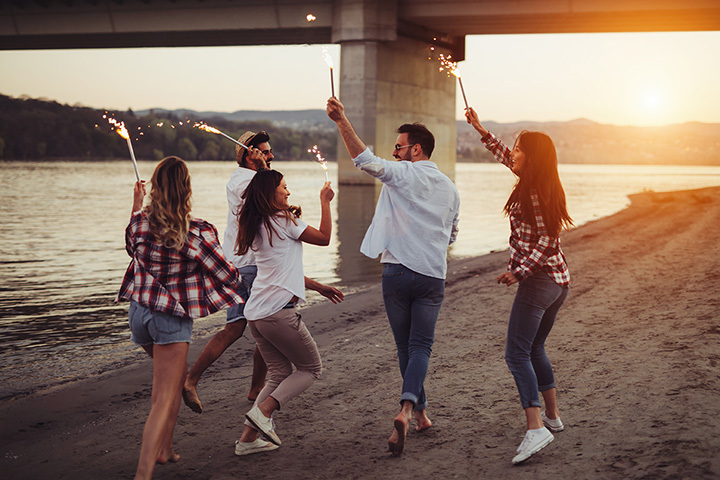 The very first Fourth of July fireworks display was held on July 4, 1777 in Philadelphia, a year after the signing of the Declaration of Independence. The show began and ended with a display of 13 rockets being launched on the commons. The celebrations vary across the nation. While the festivities generally follow the same theme, different cities add their own unique twist to the holiday. Here's a list of the best cities to celebrate the Fourth of July that will have you brimming with patriotism. It doesn't get much more patriotic than this SoCal city. With major military bases scattered across the area, San Diego residents show a great deal of pride for their country. Fireworks will be set off from barges scattered throughout the Bay off Shelter Island, Harbor Island, Embarcadero North, Seaport Village, Embarcadero South Marina Park, and Coronado Ferry Landing. The city's near-perfect weather and immaculate beaches help create the ideal atmosphere for a fireworks display. Not only that, but it's the perfect vacation spot to spend a long weekend away with friends and family. Deemed America's "most patriotic town," Bristol, Rhode Island is the home of the oldest Fourth of July celebration in the United States. The inaugural parade was held in 1785 and the town has had one every single year since then. The celebrating begins a whole lot earlier in Bristol than it does in most towns as they kick of the festivities on Flag Day, June 14. The following three weeks are filled with fun events such as baseball games, concerts and fun runs. Fireworks are held on July 3, but the main attraction is on July 4: the legendary Military, Civic and Firemen's Parade that draws over 200,000 state residents and people from all over the world. You can always count on Vegas to party all day and night which makes their Fourth of July one of the wildest in the country. Kick back, relax and spend the holiday living it up in a city that knows how to celebrate. Bars, casinos, and pool parties are adorned with patriotic decorations. All of the bars and restaurants will feature drink and dining specials. The party will be bumping all the way down the Vegas strip but be sure to grab a prime viewing spot of the Caesar's Palace Firework Show on June 30, starting at 9:20 p.m.
New Orleans provides an environment that will be enjoyable to all demographics on this holiday. Similarly to Vegas, New Orleans pretty much invented partying. Fireworks are shot up over the Mississippi River aboard "dueling barges" beginning at around 9 pm. The American Pyrotechnics Association rated New Orleans as one of the "Top Five Must-See Firework Displays in the U.S." Watch the sky illuminate with color for 15 to 20 minutes and after head down to the French Quarter to celebrate for the rest of the night. Bend was ranked first for town pride by Travel + Leisure, and they sure know how to throw a good, old-fashioned American celebration. Most of the day's festivities occur in Drake Park and began at 11 a.m. Activities include classics like pie-eating contests, watermelon-eating contests, three-legged races, and water balloon tosses. Bend hosts a truly traditional, American-style party that is unlike any other spot in the country. Is there a more patriotic place to celebrate our nation's independence than in the capital itself? D.C.'s celebrations feature marching bands, floats, famous political figures, colonial reenactments, and of course, an unforgettable parade. Enjoy the more historical aspects of this special day by visiting the National Archives to see the Declaration of Independence on display. After that, stop in to the National Portrait Gallery and visit the "America's Presidents" exhibit to see stunning portraits of 43 American presidents. You may not have heard of this Northern Arizona city's popular Independence Day celebrations, but Flagstaff is riddled with American history. The name itself has great significance to this country. On July 4, 1876, Boston emigrates stripped a pine tree to raise an American flag in celebration of the nation's centennial. Their makeshift flag staff (where the name comes from!) ultimately became a historic landmark for others traveling through the area. This Fourth of July, The Flagstaff Symphony Orchestra will hold their annual, free Independence Day concert. And what better way to celebrate your love for this nation than visiting the Grand Canyon? The sprawling national park is easily accessible and will fill your heart with American spirit. The Hub of the Universe, as some Bostonians may refer to it, is regularly recognized for its legendary Fourth of July celebration. One of America's most historic towns, the festivities include the Boston Pops Firework Spectacular complimented by live music performed by the immensely talented Boston Pops Orchestra. Keep your ears ready for live canon fire and be on the lookout for an impressive pyrotechnic display launched off from seven barges in the Charles River. Named by Travel + Leisure as one of "America's Best Towns for July 4th," Boulder is a must-visit spot this holiday! A typical Fourth of July celebration includes activities such as a beer garden, farmers' markets, and much more! The largest fireworks show in the state, called Ralphie's Independence Day Blast, launches out from the Colorado University stadium and is accompanied by the school's mascot Ralphie the Buffalo (yes a real, live buffalo!). What makes this small mountain town so special is its unique start time for its Independence Day parade: midnight. This is why the town can claim the name of the "First July 4th Parade in the Nation." Once the clock strikes midnight, the celebrating begins. Over 100,000 attend this event despite the population of Gatlinburg being just a little over 4,000. At noon, everyone flocks to the in the Little Pigeon River for the River Raft Regatta downtown. According to Gatlinburg's official website, "anything floatable" can be entered into the contest. Awards are distributed to the most creative "rafts" and to the oldest/youngest participants. In a week-long celebration commemorating this great nation's independence, the City of Brotherly Love delivers no shortage of excitement. The city where the Declaration of Independence was signed shows what their made of with a whole collection of exciting events including the huge and free "Wawa Welcome to America Concert," featuring Pitbull! As cliche as it sounds, everything really is bigger in Texas. Houston is the home of the country's largest land-based fireworks show. The Freedom Over Texas Fourth of July celebration includes an incredible six hours of activities and entertainment. Following that, the city puts on a massive fireworks show impeccably choreographed to music. At this year's show, check out a great performance from country music star Chris Young. This iconic American city's Fourth of July celebration features the country's largest pyrotechnic show with fireworks shot from multiple barges scattered along the East River as well as the Brooklyn Bridge. Catch a perfect view of the show in Manhattan, Queens and Brooklyn. The celebration also features performances from award-winning musicians every year, hosting big names such as Lionel Richie, Ariana Grande and Miranda Lambert. For those interested in the history, Big Onion Walking Tours holds a tour of important city landmarks from the Revolutionary War. The tour stops in spots including the graves of Alexander Hamilton, General Richard Hamilton and other areas connected to George Washington and Thomas Jefferson. The Windy City is a hoppin' spot on this patriotic holiday. Navy Pier on the Chicago shoreline is the place to be with delicious dining spots, boat cruises, and a variety of other activities. The fan-favorite firework display at Navy Pier gets bigger and better each year. If you're lucky, maybe you'll snag a coveted viewing spot atop the Navy Pier Ferris wheel. Here, you can watch the Chicago sky light up for seven minutes, 150-feet above this beautiful city.